Easy access to shopping, dining and skiing, along with affordable lodging prices makes this one of the most desirable locations in Breckenridge! This charming mountain lodge in the heart of Breckenridge sits directly across the street from the Four O'Clock ski run and mere steps from historic Main Street. To travel farther afield, Breckenridge offers a free public transport system that will pick you up right across the street and take you to the gondola that's only three blocks away. Choose a hotel room, studio, or 1-, 2-, 3- or 4-bedroom condominium with the option of a loft, private hot tub, fireplace or private balcony. Guest rooms offer DVD players, gas fireplaces and climate control. The River Mountain Lodge is pleased to provide free local, domestic and international long distance calling for all guests. Additionally, free WiFi is provided throughout all rooms and common areas. All rooms are provisioned with premium cable television programming, including sixteen high-definition channels. Kitchens include a refrigerator, oven, dishwasher, microwave, coffee/tea maker and extensive cookware/dishes/utensils. Each bathroom has a hair dryer and complimentary travel toiletries. Daily housekeeping services are available upon request. Most rooms include private laundry facilities (see individual unit descriptions). 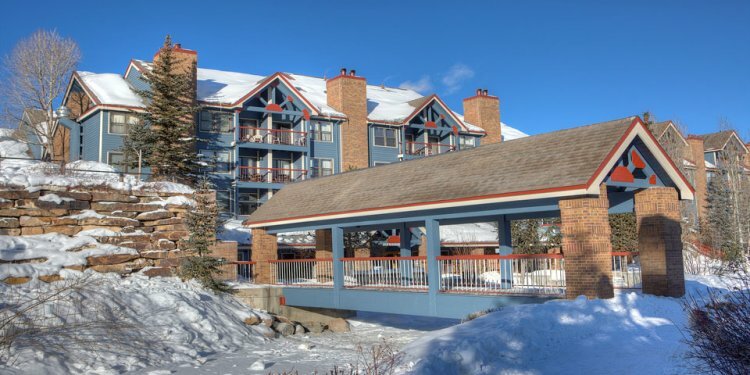 Resort Amenities: Cozy and congenial, River Mountain Lodge offers all the luxury and convenience of a condominium with the added benefit of a warm, friendly staff. Enjoy 24-hour bell and front desk service, an outdoor heated pool, hot tubs and a fitness center. Peak Ski & Bike is on site to take care of all your ski, snowboard and biking needs! Celebrate a hard day on the slopes with an apres ski cocktail in the Fireside Lounge, located in the main lobby. We invite you to stop by and say hello to Bubba, Breckenridge's favorite bartender, and enjoy his nightly drink specials! Or, simply sit back and enjoy the mountain views from your private balcony. River Mountain Lodge has a variety of meeting spaces and regularly hosts weddings, corporate groups and business retreats. Whether you are heading to Breckenridge in the Summer or Winter, there is plenty to do. You can shop or dine in Historic Downtown, explore the many trail systems or hit the slopes at Breckenridge Ski Resort!